Oh how I missed wearing my hat and a good pair of denim shorts! I actually found these shorts in my fathers closet, if you can believe that. I was looking for a pair of his old jeans to cut up and came across these, and yes they were originally this short lol. He said he wanted to make a pair of shorts but cut to much fabric off and never ended up wearing them. Oh the 80s and their grown men in short-shorts, thank god those days are over! I at least got a pair of awesome Levis out of his failed attempt at keeping up with the fashion trends of the time. Anyways, I added my DIY mesh-back shirt which has a nice textured lace detailing. White paired with light denim is such a classic look and acts as a neutral backdrop that allows you to play around with other more dramatic pieces like this awesome cat jacket. This cool jaguar jacket is a thrifted treasure I found a couple of months back and its finally been nice enough to wear. It has that 90s sport jacket shape to it with the gold hardware adding a hip-hop feel. I finished it off with my favourite black lace heels that I've featured before, but now theres a close up of them in which you could see the floral detailing a lot better (don't mind the dirt aha). I found this random picture on Instagram one night, and since then I have been wanting a sweater with a mesh back. So I went on a hunt. 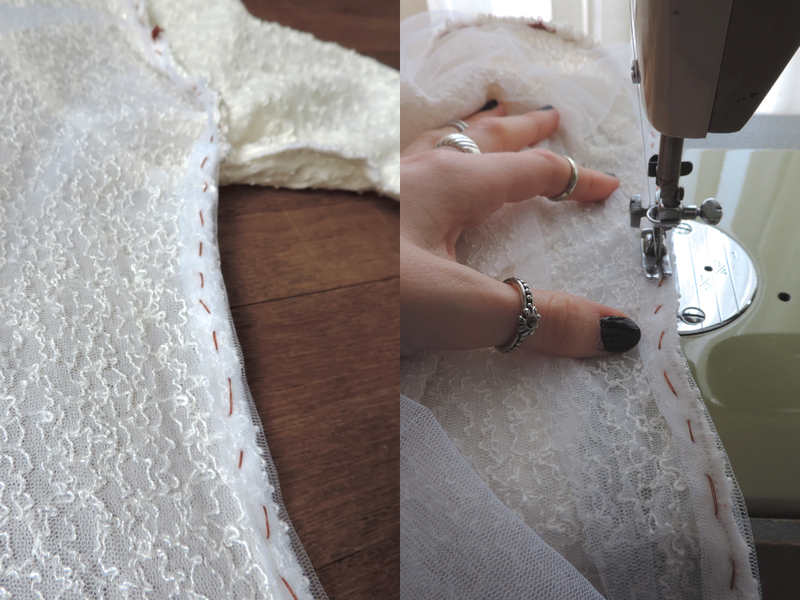 At first I was just looking for something similar at retail stores, but go figure I had no luck, so I decided to put my mind and my sewing machine to work and make my own, cause I wasn't going to go the spring without getting my hands on one of these. I intended to find and use a fluffy sweater like the one in the picture, but the ones I did find at H&M were expensive and I didn't want to run the risk of making a mistake and losing a sweater. So as a cheaper and I think wiser alternative I picked up a textured top and the thrift store. Okay rant over, lets get started! Mesh- I bought mine at the fabric store for cheap. I got 2 yards from $10, but I only ended up using less then half. That being said, depending on the size of your shirt I would say 1 yard would be enough. Top- This can be any kind of top, from sweater to tank, anything works. I would say that picking something light weight is key, the mesh is a super light weight material and if you have a heavy front piece the shirt will end up pulling forward and lifting the back piece making it uncomfortable to wear. Carefully remove the back piece, I suggest not using scissor because you'll end up cutting off some fabric and you'll need that extra length when making your edges. I decided to keep the sleeves and neck in-tacked and just add mesh to the back piece of the top. You're then left with this piece which will be used as a outline when cutting the mesh section. STEP TWO: Grab the mesh and lay the back piece you cut out on top, pin it down to make it easier. Measure about a 2 inch allowance around the entire piece and trace the pattern with some coloured chalk. If your mesh material is stretchy then you can get away with only leaving a 1 inch allowance. STEP THREE: I folded the mesh piece 3 times to make the edge and the shirt raw edge in on itself once. Thats when the 2 inches extra come in handy. Pin the entire mesh piece to the back of the shirt (remember to do these inside out). Then base stitch the entire piece, if you feel comfortable enough you can go right from the pins to machine sewing it. STEP FOUR: Machine sew the two pieces together. You can sew it by hand but it wont be as secure, unless you use tight stitches and double thread. Hope you enjoyed this tutorial and find it inspirational in making your own mesh tops for spring!